What’s Wrong with the Radish? Something’s wrong with the humble radish. When I was a kid I remember these funny little root vegetables burning my face off from just a single bite, but lately I’ve found they have no more kick than a cramped kangaroo. Part of me suspects that the heat of the modern day radish has somehow been bred out of it for a wider appeal to mainstream American consumers. 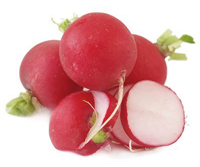 A quick check of Wikipedia reveals that there are no less than 10 common varieties of radishes. The Cherry Belle is the version most often purchased in North American grocery stores. From the taste and smell of them they must be some of the blandest radishes on the block. I first became addicted to radishes when I was very young. My aunt grew them in her garden and would often give them to me and my cousins to chomp on along with freshly dug carrots. Aunt Lorraine’s radishes were strong enough to put hair on your chest and I loved them to death. I also remember the veggie from the Passover celebrations in my church. Part of the ritual involved eating “bitter herbs” and although radishes were probably not historically accurate, I distinctly remember eating slices of radish on pita bread while listening to Fiddler on the Roof. Come to think of it, I’m not sure why our Catholic parish ever celebrated a Jewish event, but I’m glad we did because that’s where I learned to love radishes. These days radishes might as well be turnips or potatoes because they have about as much flavor. I’ve searched high and low for radishes with heat and not found any in years. The topic came up at lunch today with the guys from work and David suggested checking out the locally grown radishes of the Piedmont Triad Farmers Market. I’ll be heading there this weekend to do some research and hopefully return home with my hot-headed pearls. If all else fails, you can be sure I’ll be sending away for my own super-hot radish seeds next spring. By hook or by crook, the heat will be on! I would definately recommend growing your own – you could even grow some very unique varieties that you won’t find in the shops. I grew some yellow raddishes this year, although having experimented, I prefer the red ones! They are dead easy to grow and within six weeks or so of planting you can be eating them. I loved them as a kid, too – and still remember that they sometimes burned my tongue. The ones available now, also here in Europe, just look alike, but have no more similarity anymore. We turned to organic a few year ago, by getting a basket of organic vegetables delivered directly from the farmer every week. This brought back a lot of taste! It was different from the organic food in the supermarket, because this farmer really specialized in this and grew a lot of the stuff himself. Unfortunately the success of this has decreased quality a lot lately. We heard about this by word-of-mouth from friends, and when we liked it, we again told all our friends. When you tell the story to new people now they either say “we have it, too”, or “we heard that already”. The whole thing has become a huge organization, most of the vegetables are not grown by the farmer anymore, and they even use a call center now. The farmer’s market is definitely a good idea. Its incredible to go into detail with potatoes for example. There are so many different ones with incredibly different taste. Sorry, forgot to mention that you need to look out for the yellow ones with the “ripples”. The normal yellow ones are not very different to the red ones.